The Dark-eyed Junco, commonly called the snowbird because of its sudden appearance around winter bird feeding stations, is a member of the sparrow family. By October I begin seeing this bird arrive at my feeders. A sure sign of the winter to come. It was first thought that there were five different species. Today, all have been re-classified as one species, the Dark-eyed Junco. 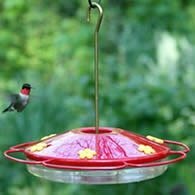 Often the most abundant bird at the bird feeders but by mid-March for most of us East of the Rockies, this bird suddenly disappears. When I see no more of these birds on the ground under my feeders, I know spring has come. These birds are about 5 to 6 1/2 inches long. The bill is pinkish and the eyes are dark. This bird varies geographically. The eastern "Slate-colored" race is uniform dark gray or brownish gray depending on whether it is male or female. The western "Oregon" race has black (male) or gray (female) hood and brown back. The western "Pink-sided" race has a gray head and pinkish sides. The "Gray-headed" race of the southern Rockies and Southwest is light gray with a reddish-brown back. The "White-winged" race of north-central states has white on the tail and usually white wing bars. These birds are generally monogamous (one male to one female) defending their territory during the nesting and breeding season. 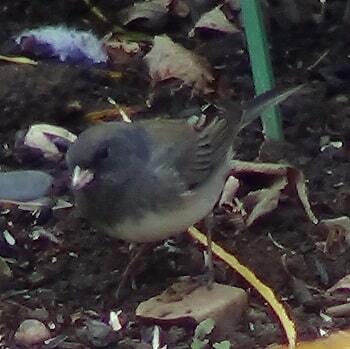 Where their ranges overlap the different races interbreed freely and all are called Dark-eye Juncos. The mating rituals are similar to other birds. A male will approach a female and bow and do a wing quiver. He also fans his tail in a display to attract the female. Chases occur and eventually the female will pick the male she decides is best. 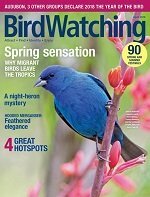 By April these birds begin to move from their wintering grounds to head north to their nesting territories. The female builds and places its nest on the ground near tall vegetation. The nest is cup shaped and built using grasses, moss, and twigs. The inside is lined with finer grasses, rootlets, and hair. The female lays 3 to 6 gray or pale bluish eggs with dark blotches. Eggs can vary quite a lot. Incubation generally begins the night before the last egg is laid. The female incubates the eggs for 12 to 13 days and the young leave the nest about 9 to 13 days after hatching. Most of us in the lower 48 never get to see these birds during the breeding season as they move much further North. Although they can be found during the breeding season in higher elevations. These birds feed mostly on the ground, eating weed and grass seeds in the wild. 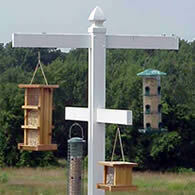 In summer these bird feed mainly on insects. 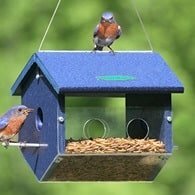 Attracting Juncos to your feeders is as easy as scattering some finely cracked corn or millet seed on a tray feeder. A tray feeder keeps the seed off the ground. Seed tossed on the ground gathers moisture causing the seed to spoil. 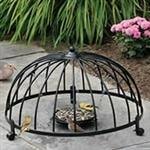 This can be harmful to the birds. 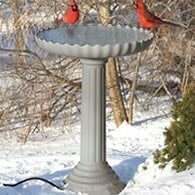 A Heated Birdbath can help provide these and any other birds in your backyard. The nice thing about the heated baths is you can use them all year. These birds have an interesting wintering habit. Males will winter farther North than females. Younger males will winter farther north than older males. It's believed Dark-eyed Juncos do this in order to get back to the breeding ground to claim territory. Since females do not claim territory, they can winter farther south.